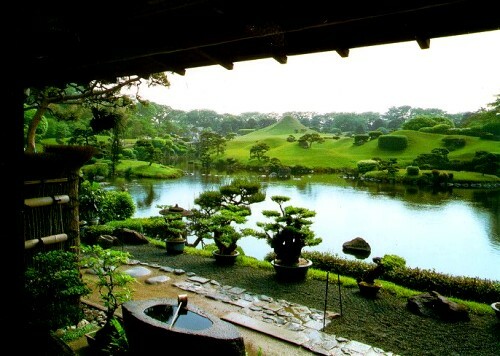 The Japanese and Chinese are undoubtedly the masters of garden illusion. 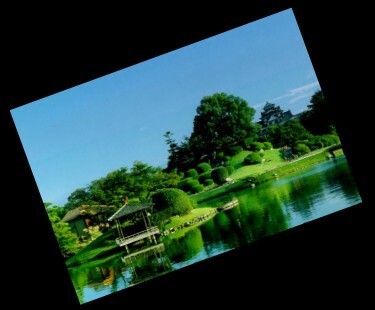 Here a range of mountains and and a vulcanic peak are reflected in the shinning waters of the lake at the kaimyo stroll garden Suizen-ji in Kumamoto. Japanese Gardeners use subtle and simple designs to represent the illusion of the natural world in miniture with the emphasis being on tranquillity and calm. Colour, especially that of flowers, is kept to a minimum, while form and function are emphasised. Not for these gardeners the clutter and riot of the cottage garden or the overt excentricity of the English gnome collection. A Japanese style garden should be a place of quiet reflection, with as little as possible to distrub contemplation. Simplicity is the key to this style, with 'more is less' being the most improtant principle. 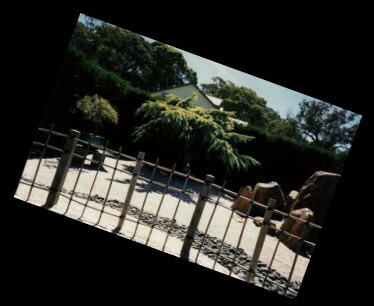 Gravel in a Japenese dry garden landscape usually represents water. Perhaps a serene sea, rapids, waterfalls or the trickle of a small stream. The gravel is raked to form whirlpools, streams and waves and can be a wonderfully fluid looking medium. Water polished pebbles can be used to represent fast flowing water within a garden setting. Boulders and rocks are often placed within the raked gravel to represent islands or to serve as simple stepping stones. These gravel and stone gardens are austere and contemplative places with little or no ornamentation. They are also extremely restful as there is little to over excite the senses or distract the eye. Water is often an important part of a Japanese landscape. It might be a vast lake, as above. Or a series of ponds along a stroll path with simple stepping stones or wooden bridges, leading, perhaps, to a secluded teahouse. From a miniture woodland stream, or the clacking of a "deer scare", to a simple tiny pond in a stark landscape of reeds, gravel and rocks, water enhances the gardens tranquility. The soothing sound of moving water calms the spirit and causes the visitor to pause and contemplate the beauty of the garden scene.